(Evangelical Focus) — The Evangelical Alliances of Italy, Spain and Malta have signed an open letter to the World Evangelical Alliance denouncing what they believe is an “ecumenical agenda” that is contrary to the historic vision and positions of the body representing more than 600 million evangelical Christians in the world. The Italian Evangelical Alliance (AEI), the Spanish Evangelical Alliance (AEE) and the Evangelical Alliance Malta (TEAM), are members of the European Evangelical Alliance and of the World Evangelical Alliance. 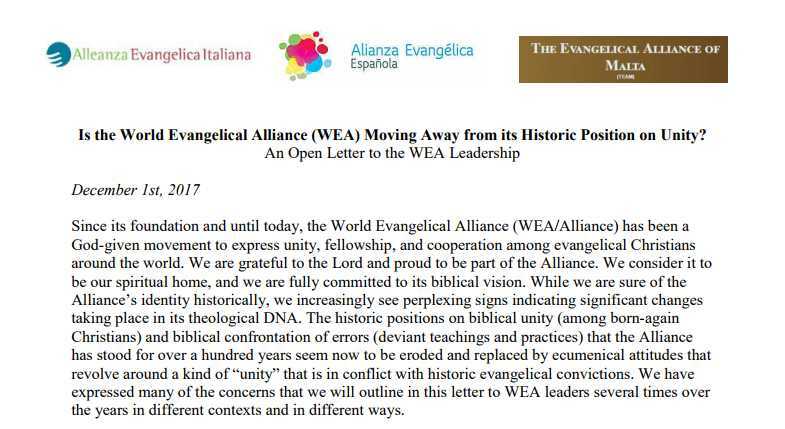 The eight-page long letter is entitled “Is the World Evangelical Alliance (WEA) Moving Away from its Historic Position on Unity?” and was issued on December 1. Read the letter. “The historic positions on biblical unity (among born-again Christians) and biblical confrontation of errors (deviant teachings and practices) that the [World Evangelical] Alliance has stood for over a hundred years seem now to be eroded and replaced by ecumenical attitudes that revolve around a kind of ‘unity’ that is in conflict with historic evangelical convictions,” the signatories say.